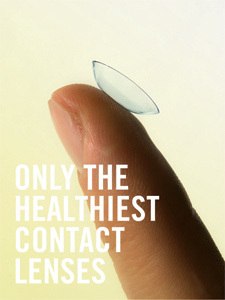 The healthiest contact lenses available! Because of our mission to provide our patients with the highest quality products and services, we only fit lenses that are healthy for the patient, and provide the most comfortable wearing experience. We do not offer generic brand contacts and do not fit lenses that have an increased incidence of eye infections. Air Optix Brand Contact Lenses- Air Optix Aqua, Night and Day, Air Optix for Astigmatism, and Air Optix Multifocal Lenses. Purevision Brand Contact Lenses- Purevision Spherical, Purevision Toric and Purevision Multifocal. Proclear Brand Contact Lenses- Proclear Spherical, Proclear Toric, Proclear Multifocal, and Proclear Multifocal Toric. Acuvue Oasys, Acuvue Oasys for Astigmatism, Acuvue Oasys for Presbyopia, and Acuvue Advance for Astigmatism. Various RGP (hard) lenses including Boston EO, ES, and XO designs. Spherical Lenses– This type of lens corrects for nearsightedness (myopia) or farsightedness (hyperopia). Toric Lenses– This type of lens corrects for astigmatism, a condition resulting from different curves on the cornea. Fortunately for patients with astigmatism, technology is constantly providing new options for soft contact lens wear. Many patients who were told previously that they could not wear contacts due to their astigmatism are now ideal candidates to wear this type of lens! Multifocal Lenses– Ocean Eye is one of the few practices in our area to fit these lenses. This type of lens provides patients with an option other than reading glasses! If you wear reading glasses or bifocals, and would like the option of wearing contacts lenses and no glasses, be sure to ask our specialized staff about this new technology! Contact lens fitting explained. A contact lens fitting includes the time spent by our doctors and/or staff to evaluate the contact lenses on your eyes for proper coverage, proper movement, any surface problems with the lenses, and any corneal complications secondary to lens wear. We also spend time with the patient to ensure they are comfortable with inserting and removing the lens, and are able to correctly clean and disinfect the lenses on a regular basis. The contact lens fitting fee also includes a complimentary pair of lenses and any additional follow up care needed in the first 3 months after a new brand of contact lenses (usually 1-3 additional visits). For additional information on contact lens fittings, please review our patient handout on Contact Lens Fittings.